Scouting provides young people the opportunity to enjoy fun and adventure while developing the skills they need to succeed, now and in the future. We’re talking about teamwork, leadership and resilience – skills that have helped Scouts become everything from teachers and social workers to astronauts and Olympians. We do this through a programme of fun and adventure, where young people can take themselves out of their everyday comfort zones and learn to overcome challenges and fears. Challenge and adventure can come in many different ways - but ask any Beaver, Cub, Scout or Explorer (and indeed leaders) ,most can remember the first time they leant back on a rope to start their first abseil. 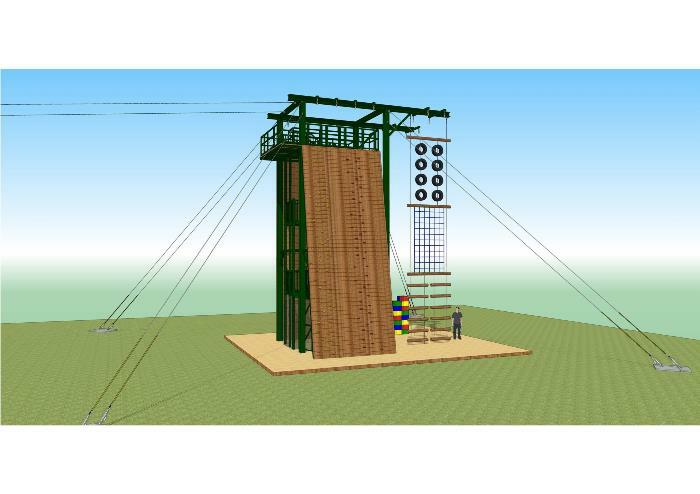 Our current abseiling tower at our District Campsite at Adamswell has served us well for around 30 years, but the time has come to replace this tower, with a new purpose built bespoke climbing and abseiling tower which also includes a zip wire, crate stacking and jacobs ladder elements. As you can see from the picture below this provides so much more than our current offering. These things however come at a cost - and with design, build and installation costs coming in at £125,000 we need to raise some funds. The District Executive have allocated half the money from reserves and we are busy applying for grants from a variety of sources, but we know the shortfall will have to be made up from our own fundraising efforts. Plans are being put together for a grand raffle, a sponsored event and a quiz night, but we realise these are not for everyone and so with this in mind we have enabled anyone to make a donation, be that past members - users of the campsite past and present, scouting families who just want to make a donation - literally anyone who wants to make a donation can do, whether that be £1 or £1,000 every donation is gratefully received and helps to bring this fantastic facility from a colourful drawing to an exciting facility to be used and enjoyed by all. How you can help- you can donate any amount you would like to help our campaign via our Virgin Money Giving page by clicking on the button below, dont forget as a tax payer you can choose to gift aid the donation to make it worth more! Help us build our tower brick by brick. £20 buys a commemorative certificate and entry to our online fundraisers Hall of Fame. £50 buys a commemorative certificate and your name will appear on our donations wall which will be located near to the new climbing tower. Purchase your "brick" by following the link to the donations page on Vigin Money Giving. Please note that by leaving your name/nickname in the optional box on the giving page allows us to list your name as you type it on the fundraising wall. If purchasing the £250 premium listing/ plaque please ensure you complete the message box as well. We would love to hear from corporate sponsors as well, and wopuld encourage any company able to donate £1000 or more to contact us to discuss suitable packages which may include newsletter sponsorship, or the use of some of the facilities at Adamswell for a corperate day.